The Muslim World League and the World Assembly of Muslim Youth are part of a worldwide network of largely Saudi-funded groups that maintain offices in many Muslim-majority countries as well as in European nations with relatively large numbers of Muslims, such as France, Germany and the United Kingdom. The primary focus of these organizations is on promoting Islamic teachings and encouraging Muslims to be more religiously observant, as well as providing interested non-Muslims and recent converts with information about Islam. The Muslim World League undertakes a broad range of activities focused on the propagation of Islam in Europe, including publishing and media outreach, coordinating the regional activities of preachers and religious scholars, Arabic language instruction and the establishment of Islamic centers. The World Assembly of Muslim Youth focuses primarily on promoting Islamic solidarity among Muslim teenagers and young adults in their early 20s. To this end, the Assembly organizes regular international soccer tournaments, youth camps, and educational exchange and scholarship programs that enable students to study classical Islam, often in Saudi Arabia. Both groups have strong ties to Saudi Arabia and to its religious and political institutions. For example, the secretary general of the League – a position currently held by Abdullah bin Abdul Mohsin al Turki – is always a Saudi national, and the programs promoted by both organizations are strongly influenced by religious currents coming out of Saudi Arabia. Both the League and the Assembly also are heavily involved in promoting global da’wa. Da’wa, which means “call” in Arabic, refers to efforts to propagate or strengthen the Islamic faith around the world. Those committed to da’wa encourage both Muslims and non-Muslims to better understand Islam. While many Muslim organizations consider da’wa to be an important part of their missions – along with other elements of their social and political agendas – the Muslim World League and the World Assembly of Muslim Youth are wholly dedicated to the propagation of conservative Islamic teachings. As a result of Saudi money and influence, both the League and the Assembly are widely regarded as promoting the strict Wahhabi brand of Islam that is prevalent in the desert kingdom. Wahhabism was established on the Arabian Peninsula roughly 200 years ago with the aim of purifying Islam by ridding it of outside influences and advocating strict adherence to core Islamic teachings. The Muslim World League (est. 1962) and the World Assembly of Muslim Youth (est. 1972) were both founded in Saudi Arabia. To propagate or strengthen Islam (an effort known in Arabic as da’wa, meaning “call”), promote Islamic teachings and encourage Muslims to be more observant. The Muslim World League is actively involved in publishing and media outreach, coordinating the regional activities of preachers and religious scholars, Arabic language instruction and the establishment of Islamic centers. The World Assembly of Muslim Youth focuses primarily on promoting solidarity among Muslim youth and young adults by organizing international soccer tournaments, youth camps, educational exchanges and scholarship programs. Both groups are widely seen as conduits for conservative Saudi religious influences. 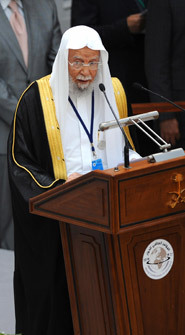 The secretary general of the Muslim World League is Abdullah bin Abdul Mohsin al Turki. The secretary general of the World Assembly of Muslim Youth is Saleh al-Wahaibi. Egyptian-born, London-based Kemal el-Helbawy has served in leadership positions in both organizations and is also a senior figure in the Muslim Brotherhood. The Muslim World League, which was founded in the Saudi city of Mecca in 1962, initially focused its efforts on promoting its version of Islamic orthodoxy to migrant laborers from other parts of the Middle East who came to work in the Saudi oil industry. In the early 1970s, the League followed the Arab migration into Europe with the aim of providing Muslim immigrants with religious education and other services that were largely not available in the West at this time. This marked the beginning of a period of intense growth for the League, which eventually opened offices in cities across Europe and North America, including Copenhagen, London, Moscow, Paris, Rome, Vienna, New York and Washington, D.C. The Muslim World League frequently partnered with a network of Islamic organizations in Europe to create a local Islamic infrastructure to serve the religious needs of the growing number of Muslims in the region. Much of this work involved funding the construction of mosques and funding the operations of Islamic centers, as well as sponsoring activities designed to spread its ultraconservative brand of Wahhabi Islam. To further its goals, the League often teamed up with other internationally recognized Muslim movements – particularly the Muslim Brotherhood – that did not necessarily share its Wahhabi worldview. The World Assembly of Muslim Youth was founded in Saudi Arabia in 1972, 10 years after the Muslim World League. Its primary goal was to give Muslim youth access to the strict interpretation of Islam advocated by the Saudi religious establishment. By focusing on Muslim youth, the group also was trying to ensure that it played a role in shaping the religious views of future generations of Muslims. Like the Muslim World League, the Assembly sometimes partnered with other Muslim groups in Europe, including the Forum of European Muslim Youth and Student Organizations and a variety of groups with ties to the Muslim Brotherhood. These partnerships were designed to help the Assembly with its outreach to specific national and local Muslim communities. Between the 1970s and 1990s, the European activities of the Muslim Brotherhood, the Muslim World League and the World Assembly of Muslim Youth became so intertwined that it was often difficult to tell them apart. Indeed, a number of senior Muslim Brotherhood figures – including Kemal el-Helbawy, the Egyptian-born, London-based founder of the Muslim Association of Britain – have served in leadership positions in the League and the Assembly. In recent years, the Muslim World League and the World Assembly of Muslim Youth have found themselves in competition with some of the organizations they once sought out as partners. In some cases, these other groups are seen as having done a better job than the League and the Assembly at addressing the needs of Muslims in the West. According to some accounts, one rarely hears younger Muslims talking about the League or the Assembly anymore. In some respects, organizations such as the League and the Assembly have come to represent a paradox. On the one hand, the groups seek to speak for the global Muslim community – or umma. But they also remain rooted in a very particular religious worldview – Saudi Wahhabism – that has not been adopted by most Muslims in the West. The influence of more established da’wa groups such as the League and the Assembly has also waned as new technologies have made it easier for other groups to reach wide audiences. Discussions about issues relevant to Muslims are increasingly taking place on the Web – in blogs and in social media outlets such as Facebook and Twitter. In many cases, those leading the discussions no longer seek or need the legitimacy that affiliation with a transnational organization such as the League or the Assembly once conferred. Even when European Muslims are seeking information on Saudi-style Islam, they can go to the websites of such high-profile scholars as Saudi cleric Salman al-Audah, the force behind the popular website islamtoday.com, and the late Nasiruddin al-Albani, rather than trying to obtain information from the League or the Assembly. Although the Muslim World League and the World Assembly of Muslim Youth are less familiar to young Muslims in Europe today than they were a generation ago, these well-funded groups continue to exert substantial influence through their extensive outreach efforts and publishing networks. And while the two groups are no longer the sole purveyors of Saudi-style Islam to European audiences, they still represent an important infrastructure for propagating conservative religious views from the Middle East throughout Europe.